In past years my family has attended the St. Mark's Church Living Manger. I was somewhat disappointed to learn that this year, due to renovations being done to the church, they would not be hosting it. Members of the church however were also a little disappointed and wanted to do something for the community. Coming up on December 2oth and 6:30pm they'll be hosting an evening of Christmas Carols in the Corner. Come by the Sussex Corner Amphitheater on the Dutch Valley Road and lend your voice to the festivities. I'm betting it will be like an old fashion Christmas where members of the community can catch up, be merry, and spread good wishes. If you can't sing, no worries, simply come for a cup of hot chocolate. 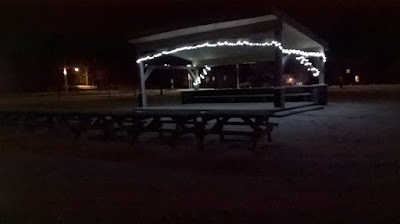 The amphitheater is Sussex Corner is a glow with Christmas lights and snow is on the ground.